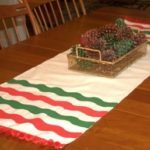 My table needed a little something to go with the patriotic centerpiece that I created last summer so I crafted a coordinating table runner using materials that I had on hand in my sewing stash. I like this so much that it may just stay on my table all summer! 1. Measure your table to determine the size of your runner. I had a small drop cloth on hand from another project and was able to use a section of it that was already hemmed on two sides. I turned under the other two sides and stitched into place. The plastic backing on this drop cloth gives it some stability, making it a perfect weight for a runner. 2. Cut two 6×6 squares from a blue fabric and from a red striped fabric eight 1×6 pieces and six 1×12 pieces. The pieces make a flag for either end of the runner. 4. The runner is now ready to use and enjoy! I’m sharing with Metamorphosis Monday at Between Naps on the Porch, with Tutorial Tuesday at Hope Studios, with Beth’s Tutorials and Tips Link Party at Home Stories A 2 Z, with Jen’s Weekend Wrap-Up Party at Taterots and Jello, with the CSI Project’s Red, White, or Blue Challenge, and with I Savor the Weekend’s Patriotic Linky Party. Great job Paula! How did you tennis match go? How cute is that, Paula??? Oh say can you see? I love it. How beautiful the red, white and blue looks on your table. I love the way the stripes have a ripple to them. Just perfect, and with the plastic backing it will make it waterproof on your wood. I love it. Great job sweetie. Great idea Paula, aren’t drop cloths just the best? I think keeping this on the table all summer is a perfect idea. Paula it’s a precious idea for the table. It all came out wonderful. Paula I love this! How pretty! A true metamorphosis. If you have a moment, please stop by and enter my giveaway. I’ve been bitten by the patriotic bug too! 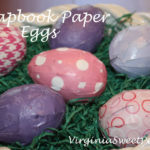 I spent all weekend whipping up crafts and tutorials! This table runner is so awesome- good job mama! Love the idea of using a drop cloth! Perfect idea. Now you have inspired me to do a patriotic table. Thanks! That is so cool, Paula! You did a great job. 🙂 Love the contrasts in patterns on the flag! That’s so stinkin’ cute!!!! I love it! It looks great with your centerpiece!! Thanks for a great idea and simple too! (Not that is looks like it!) I need to go see if we have something like this that will work. Great job! Hi, visiting from The Patriotic link party. Very cute, I love the fabrics tha you chose. The flag looks as thought it’s waving. Your table looks so clean and fresh. Must admit, I am a gobbster. I gob mine up to the max. Hee-hee! Thanks for sharing this. I made one today and it turned out great!